The Tanoshiboy Chronicles: Design & Illustration Blog: AAAAAAARRRRGGGHHH! Had a bad weekend and I'm still exhausted from it. I'm hoping things work out, but in the meantime I still have my daily sketch to do. 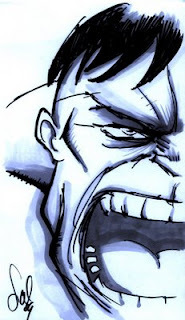 This up-close-Hulk is very fitting for how I felt on Saturday. Busted out the prismacolors too. Done with a sharpie. Have a week. Please do! Thanks for dropping by. Hope to see you daily!